In last exercise, the app "Monitor Wifi status and information with BroadcastReceiver" by monitoring of ConnectivityManager.CONNECTIVITY_ACTION, it will be broadcasted when change in network connectivity has occurred; connection has either been established or lost. In case of RSSI change will not trigger the event. In order to monitor RSSI change, we have to monitor WifiManager.RSSI_CHANGED_ACTION. In this exercise, another BroadcastReceiver, myRssiChangeReceiver, will be implemented to monitor the broadcast of WifiManager.RSSI_CHANGED_ACTION, to update RSSI if any change. Modify AndroidWifiMonitor.java only, the other files are same as last exercise "Monitor Wifi status and information with BroadcastReceiver". It look likes that the BroadcastReceiver for RSSI chage event is never called. At leadt in my tests on my device. Seems that the OS never trigger this method. But when I open a app that lookup for the RSSI change, like WiFi Analizer than the method is triggered. That what debug shows. 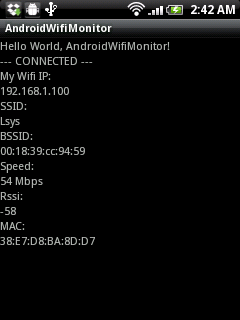 i run and test code in Android4.0 but emulator couldn't connect wireless.Each time output is DISCONNECT.In emulator browser connect the internet.But why your code say disconnect? plz do reply sir.... i will be thankfull..